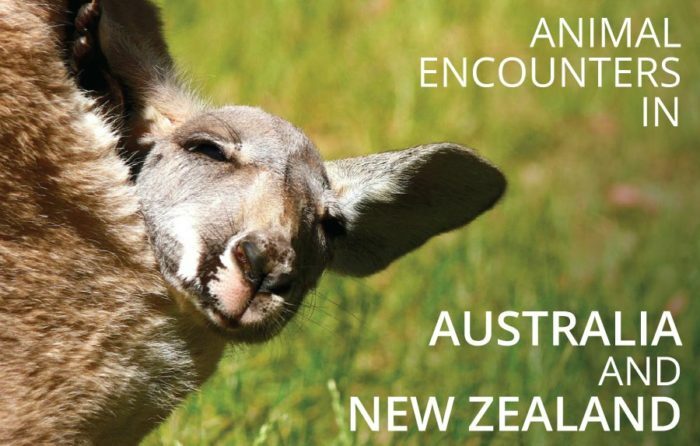 What cool animals can you see in Australia and New Zealand? There’s no doubt that Australia has some pretty cool animals! 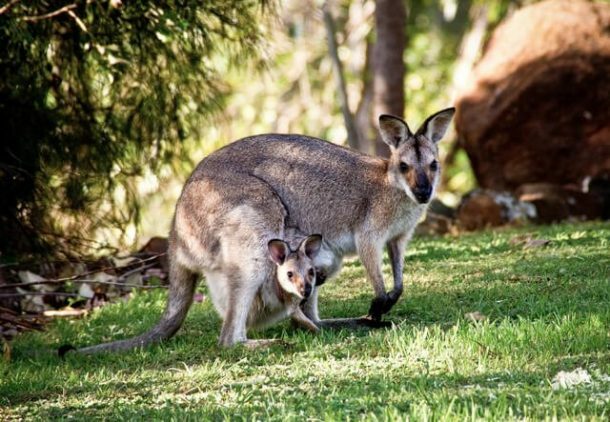 In fact, Australia is one of the only places in the world you can see marsupials – animals that give birth to under-developed young and then grow the young in a pouch. Over 70% of marsupials are native to Australia with the most well-known being kangaroos, koalas and possums. Possums can also be found in New Zealand. 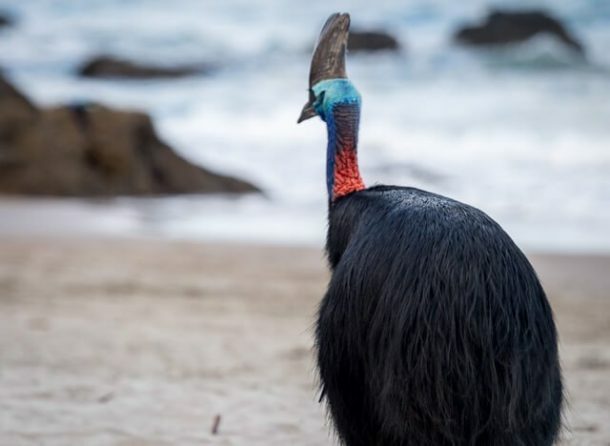 But aside from all the cool mammals that you’ll no doubt come across in your visit to Aus, they also have a bird that looks like a walking dinosaur! Nestled deep in the Western Australian countryside near the small town of Perillup, injured wildlife come to Uralla Wildlife Sanctuary for rescue, recuperation and hopefully, release. The main attraction here is the joeys and kangaroos, which the public are free to come and feed, pet and care for during their visit. Over time though they have taken in many other rescues that have no place else to go from dingoes to kookaburras, and even an adorable wombat. The set-up is entirely run by local couple John and Mandy English who rely on volunteers – usually, overseas students looking to get a real touch of Australia during their visit – and donations to keep the operation running. There are no entry fees but it’s polite to bring with you; blankets, old t-shirts (they make these into pouches for the joeys), or simply leave them some money or adopt one of the kangaroos. What we love about visiting this sanctuary with the kids are that the animals really are the stars of the show here. There are no tourist gimmicks, it’s a genuine farm property that has been converted for rescue and care. The staff live with the animals and hand nurse the joeys (they are so similar to human babies in their early year needs!). Over the years we have seen many of our favourites grow into strong healthy ‘roos that can then be released. 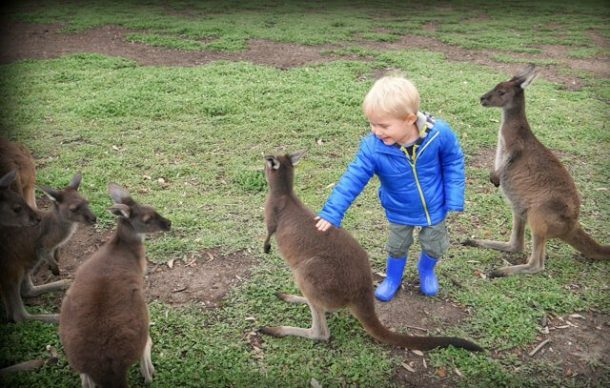 It’s by far our favourite place to have real encounters with kangaroos in Australia. Although hidden in a quite remote corner of WA, it is well signposted from the Muirs Highway. It is about a one hour drive north of Denmark on the south coast or 40-minutes west of Mount Barker. Alternatively, it’s a 4 hour 20-minute drive South East of Perth. Hamelin Bay, located in Western Australia’s Margaret River region, is home to two types of stingrays, the smooth stingray, which is the largest of the world’s stingrays and is dark grey or black and round in shape, and the eagle ray, which is diamond shaped, has pointed wings and is a paler shade of brown, brown-grey or blue-grey rather than black. The stingrays have been visiting Hamelin Bay for years, attracted by the scraps left by fishing boats that use the boat ramp and jetty on the beach. The best time of year to see the rays is summer, but they are known to visit year-round. Of the two stingrays, the smooth stingray is most likely to approach visitors. 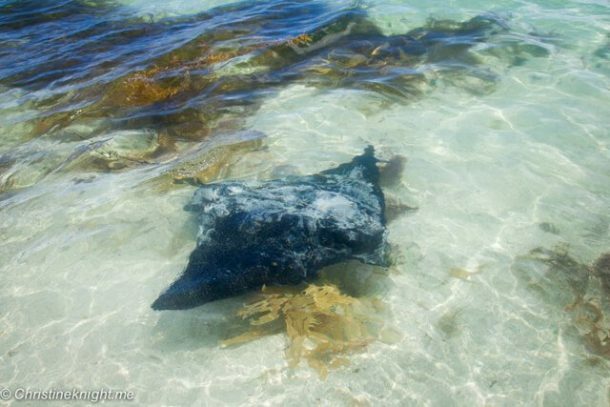 The rays patrol the beach in groups of 3 to 10 rays and can easily be seen from the beach. 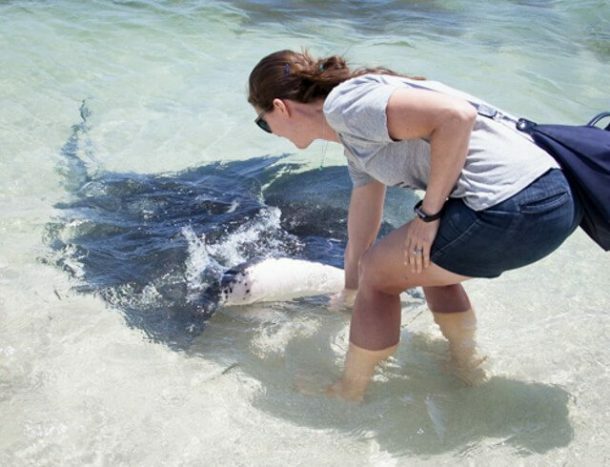 While the stingrays are gentle, docile creatures, they are wild animals with a dangerous barbed tail, so exercise caution. By Christine | Adventure, Baby! Given their name, whale sharks don’t sound like the kind of creature you want to get up close to in the water. But while technically sharks, whale sharks are actually filter feeders, like many whales. Just as well, as the largest individuals ever recorded have been over 10m long, with a jaw 1.5m wide! Living mainly in tropical waters, there’re multiple places around the world where you can get in the water and snorkel with these majestic creatures. Before doing so, though, it’s best to thoroughly research the operators and local laws, as the experience and treatment of these animals greatly vary. I had the excitement of swimming with these beautiful creatures at Ningaloo Reef, a coral reef halfway along the Western Australian coastline. All local operators are required to operate by stringent laws (covering such items at the maximum number of swimmers in the water at once and the closest boats can approach them), meaning you can interact with these gentle beasts in an ecologically sound manner. 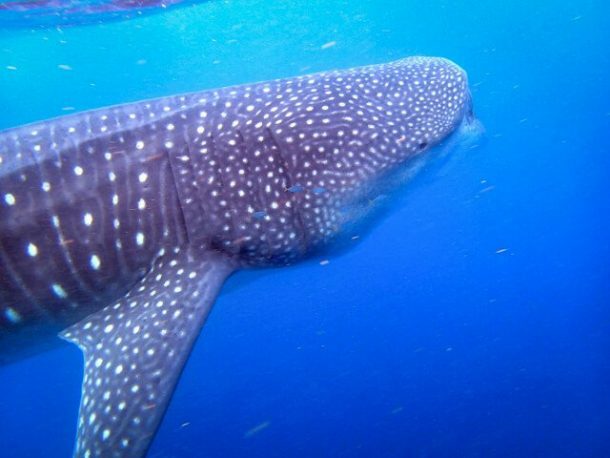 And best of all, spotter planes fly overhead and let the boats know the locations of each whale shark, meaning you have an excellent chance of encountering one or more on your day trip. 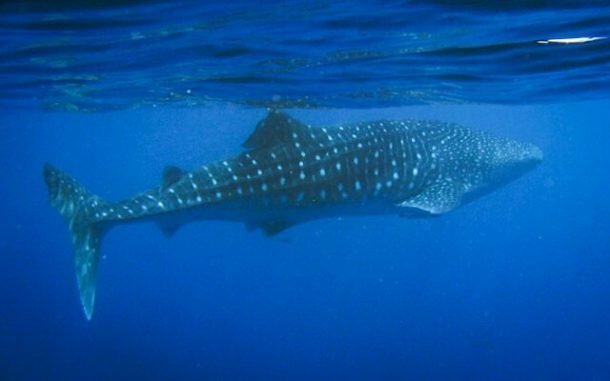 The almost guaranteed time of year to swim with whale sharks on Ningaloo Reef is between late March and late July each year. One look at a Cassowary and you’d think you’d woken up in Jurassic Park. 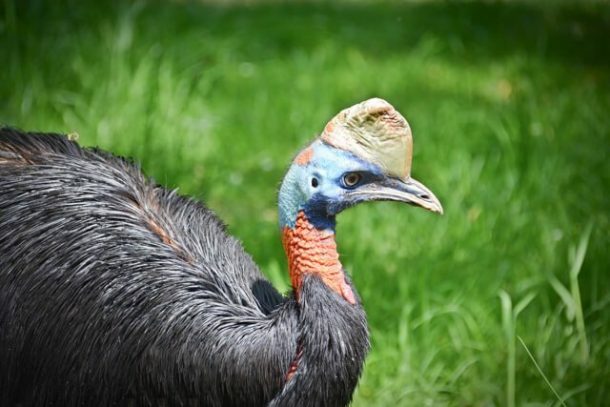 These endangered flightless, emu-like birds have a striking blue and red neck and a horn, making them look pre-historic. It was a dream of ours to see one in the wild, so we took a trip to the aptly named “Cassowary Coast”. We chose Etty Bay, a spot well known for sightings and a beautiful beach as a consolation if we didn’t. We were blessed to see four, strolling down the beach without a care in the world. 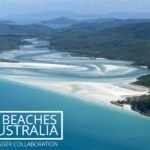 If you want to catch a glimpse of one of these remarkable creatures you can drive to Etty Bay in 40-minutes from Mission Beach or 1.5 hours from Cairns. Their preferred hideouts seemed to be in the forest to the left and right of the beach. Hang around long enough and they might take a stroll along the sand for you. Apparently, there are over 100,000 wild crocodiles in Australia’s Northern Territory and around 10,000 of them live in Kakadu National Park. 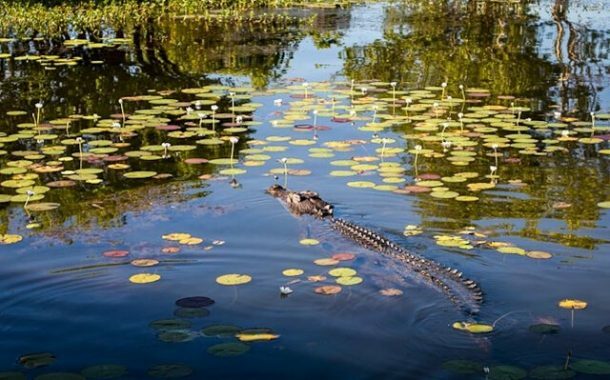 One of the best places to see crocodiles is from the 2-hour Yellow Water River cruise along the Yellow Water Billabong. During our cruise, we saw 17 crocodiles! 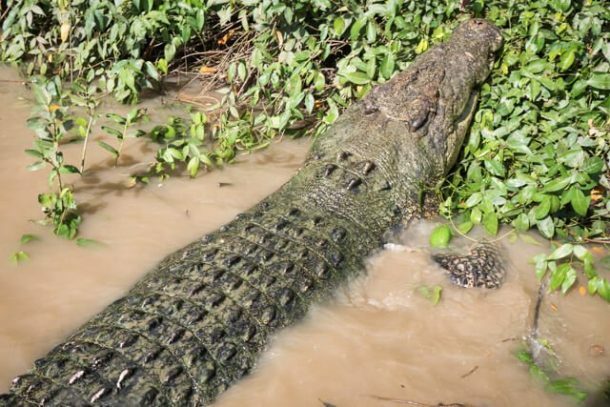 From 1 metre female crocodiles to giant monsters at over 5 metres. During the cruise, the experienced guides educated the passengers about crocodile safety in Kakadu as well as told us stories of crocodile behaviour. he most impressive crocodile we saw was well over 5 metres and was slowing zig-zagging up the Billabong alongside the boat. In his mouth, he had something large, submerged in the water which appeared to be a log. Our guide was quite intrigued as he said crocodiles don’t usually carry logs. Weren’t we all completely shocked when the crocodile brought his prized possession slightly above the water’s surface to reveal he was carrying a feral pig in his mouth! During our cruise, we also saw wild brumbies, ducks, various bird species and snakes. The Yellow Water River Cruise was one of the highlights of our entire trip in the Northern Territory. One of the most amazing animal encounters I have had was with Dolphins in Rockingham Western Australia. 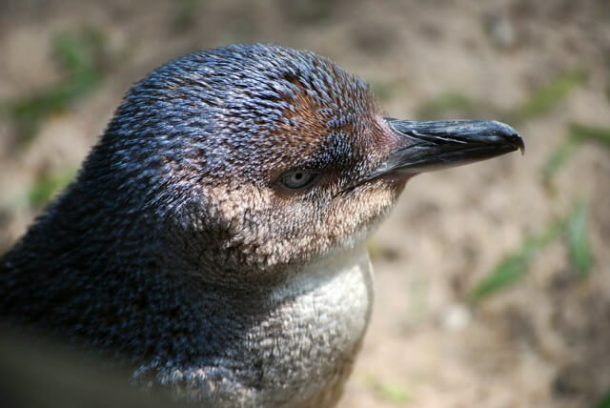 The area has a large expanse of coastline and has a diverse range of aquatic animals including a colony of Little Penguins. Dolphins here are seen on an almost daily basis and when my children were growing up the did swimming lessons at the beach, almost every day the dolphins would come in and swim with the children making their lesson something very special. My personal encounter swimming with them was one hot Christmas day, we went to our local beach to cool off and suddenly a pod of dolphins appeared and swum around us for about 5 minutes. They were not afraid and came so close we could feel their wake, it is a day I will never forget. 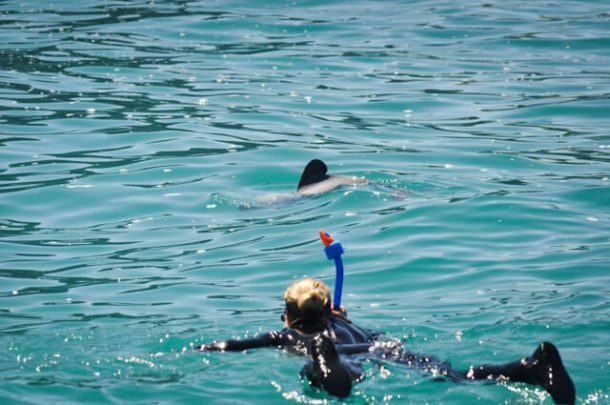 Rockingham is now famous for where people come to swim with the dolphins as a paid experience but nothing replaces the feeling of these natural interactions. Rockingham is an easy 40-minute drive or public transport ride south of Perth. Before my trip to the Grampians, I was yet to see a Kangaroo, either in a sanctuary or in the wild. That changed during my Adelaide to Melbourne Road Trip! When we reached the Grampians and made our way to the campsite at Halls Gap, there were Kangaroos everywhere! It was amazing! We hopped out to take photos of them. As this was my first encounter with wild Kangaroos, I didn’t know how to approach them. I was naive. In our rush to get as many pictures as we could, I decided to get as close as possible. I spotted two hulking Kangaroos in the distance and decided to get closer for a photo. Once I got a photo, I decided to see how close I could get. This was a bad mistake. I got to within a few metres when the Kangaroos jumped up. Startled, I ran off in fear of a vicious left hook! Once I was a safe distance away, I turned around to see one of the Kangaroos standing up on its hind legs, shaking its sizable fists at me! 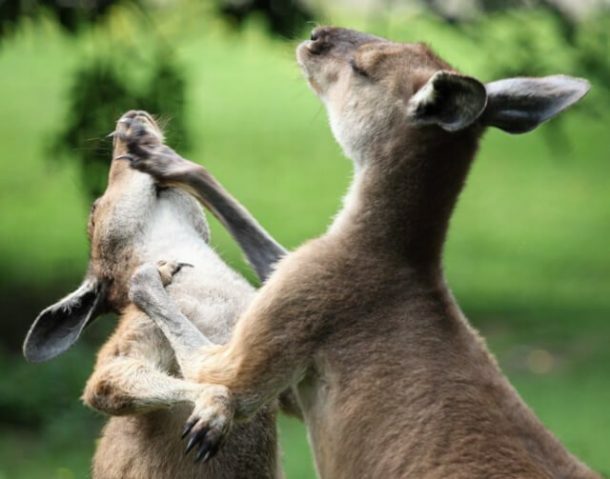 I didn’t know how to react, it was a mixture of relief, and astonishment, that I was actually witnessing a Kangaroo, effectively, challenging me to a boxing match! The standoff culminated in an anticlimax, as I walked off and so did the Kangaroo. It’s safe to say, I’ll never forget my first encounter with Kangaroos! The Little Penguin (formerly known as the “fairy penguin”) is the smallest of all penguins growing to a mere 40 cm in height. This teeny tiny, blue and white bird, nests all around Tasmania and along the southern coastline of Australia. They return to their birthplace during the breeding season, taking the exact same path every single night to feed their chicks. They are an incredible bird, although quite vulnerable these days due to feral predators introduced to Australia and ocean pollution. Thanks to their protection by locals, the area is free of feral animals. Shirley Lincoln, one of the original rescuers, now operates Low Head Penguin Tours. 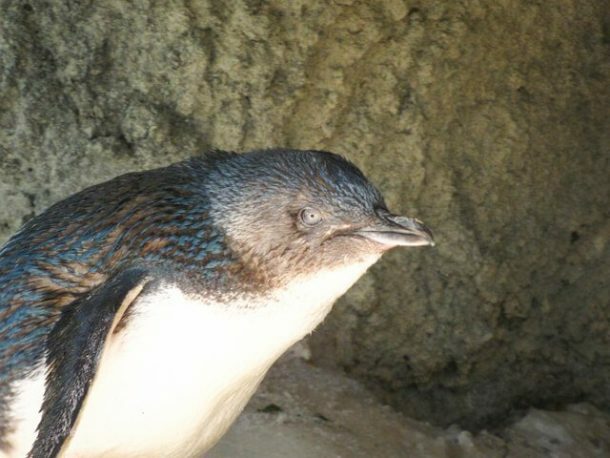 Visitors can view the nightly return of adult penguins from the ocean to breed or to feed their chicks, depending on the time of year, and the penguins are kept safe with Shirley and the team ensuring that strict measures are in place to ensure visitors don’t harm the penguins or come in direct contact with them. Hector’s dolphins can only be found swimming in the waters off the South Island of New Zealand. They’re an endangered species, with only around 7,000 remaining in the wild. 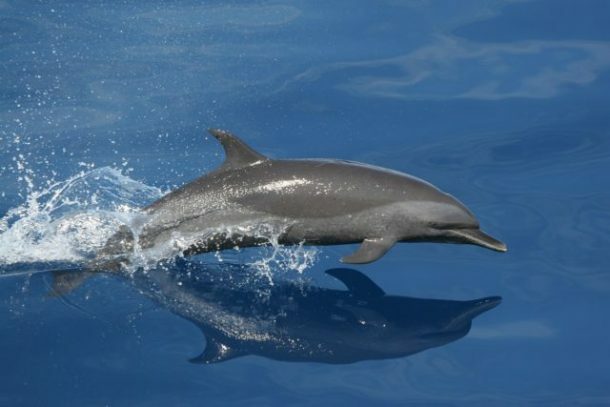 These playful dolphins are identified by their unique rounded dorsal fin and small size – in fact, they are the smallest oceanic dolphins in the world! It was such an incredible experience being in the water with these intelligent, inquisitive creatures. They effortlessly swam around and under us as we bobbed around in our thick wetsuits looking very clumsy in comparison! The Dolphins weren’t the only stars of the show either – we also got to see seals and penguins on our short commute to the harbour entrance. It was definitely an experience I’ll remember forever. 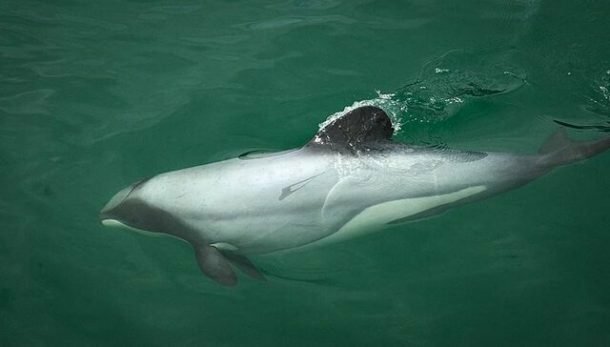 Akaroa Harbour near Christchurch has a resident population of around 900 Hector’s dolphins making it an excellent place to view them in their natural habitat. 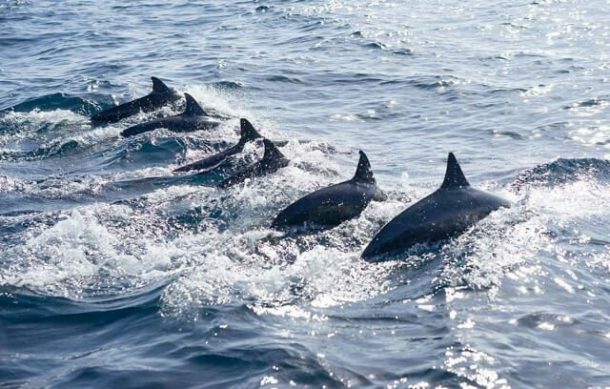 There are several companies offering excursions to see and swim with the dolphins and I recently got to experience it first hand with NZ’s 1st eco-tourism operator – Black Cat Cruises. The hike out to Harwoods Hole in Abel Tasmin, New Zealand is a pretty easy trek with a few cumbersome areas to sneak through. But it was all worth it to get to the mouth of New Zealand’s deepest vertical shaft. The boulders were beautiful, the trees magnificent and the mud was limited. 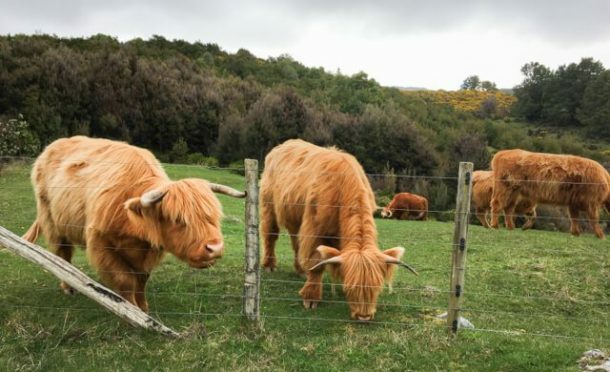 On our way out of the park, we were making our way along the narrow gravel road and we came across these beautiful, furry, orange cows. They were right at the fence line and just looked at us for a while and kept eating. We admired their beautiful coats for a while, snapped this picture and continued on our way out of the park. It was this unexpected encounter we fondly recall the most. In order to see these specific, furry beasts, you have to keep watch in the farm pastures as you first enter the gravel road, off of 60, to get to Harwoods Hole. The farms in this area have a variety of animals, so you just have to keep your eyes open for them. Closer to the car park for the Harwoods Hole are many sheep, but the cows are closer to the exit by Highway 60. Those were the nice animals in Australia. Why not check out some of the Aussie animals that probably want to KILL YOU! 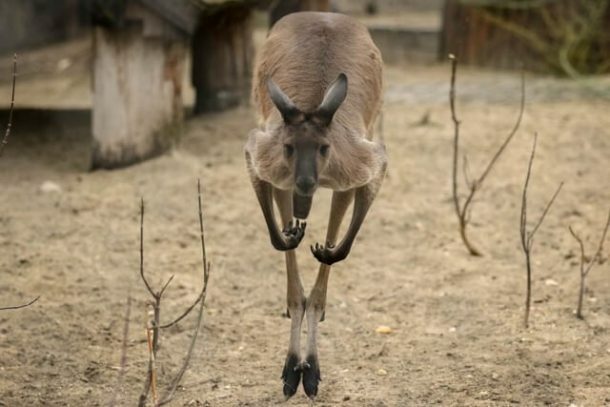 READ: 10 Australian Animals That Are Total Jerks and Definitely want to Kill You! wow, you saw so many beautiful animals! 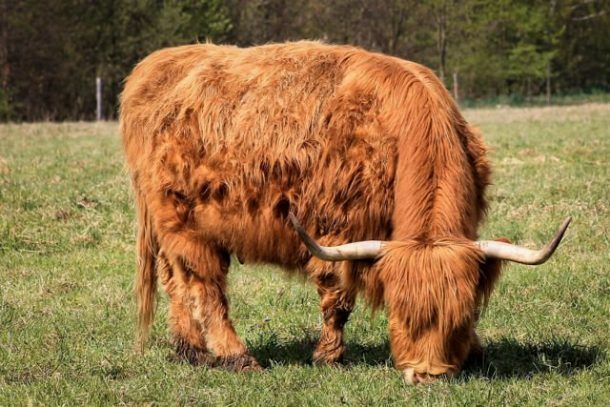 The highland cows are probably my favorite :D! 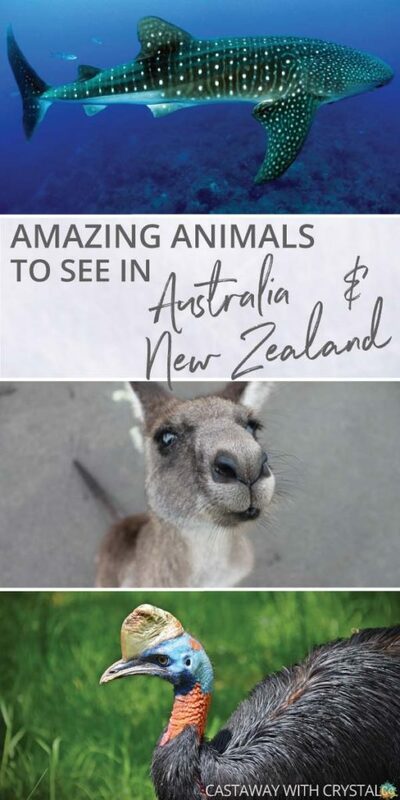 I can’t wait to visit Australia one day and see real kangaroos! Great photos! Thanks, Krista but I didn’t see them all! 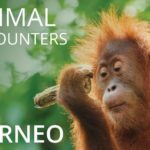 Each animal was spotted by a different blogger! 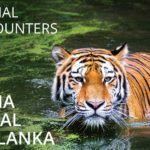 Some amazing ideas on this list, i think whale sharks would be my next dream wildlife encounter. Fabulous!